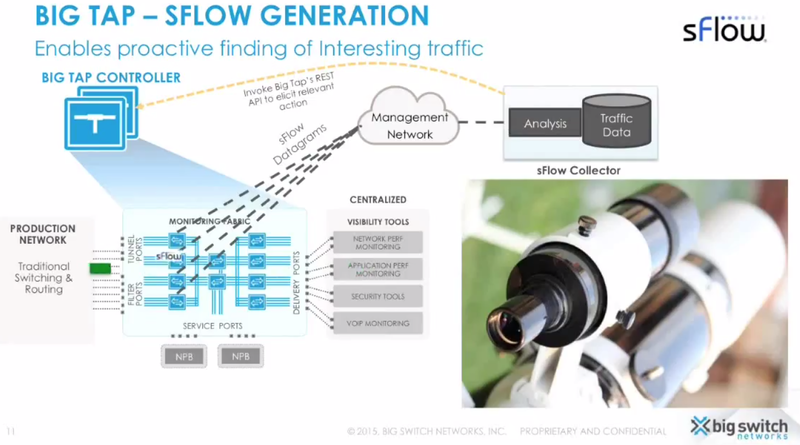 Today's Big Switch Networks webinar, Big Tap sFlow: Enabling Pervasive Flow-level Visibility, describes how Big Switch uses software defined networking (SDN) to control commodity switches and deliver network visibility. The webinar presents a live demonstration showing how real-time sFlow analytics is used to automatically drive SDN actions to provide a "smarter way to find a needle in a haystack." The webinar describes how the network wide monitoring provided by industry standard sFlow instrumentation complements the Big Tap SDN controller's ability to capture and direct packet selected packet streams to visibility tools. The above slide from the webinar draws an analogy for the role that sFlow plays in targeting the capture network to that of a finderscope, the small, wide-angle telescope used to provide an overview of the sky and guide the telescope to its target. Support for the sFlow measurement standard is built into commodity switch hardware and is enabled on all ports in the capture network to provide a wide angle view of all traffic in the data center. 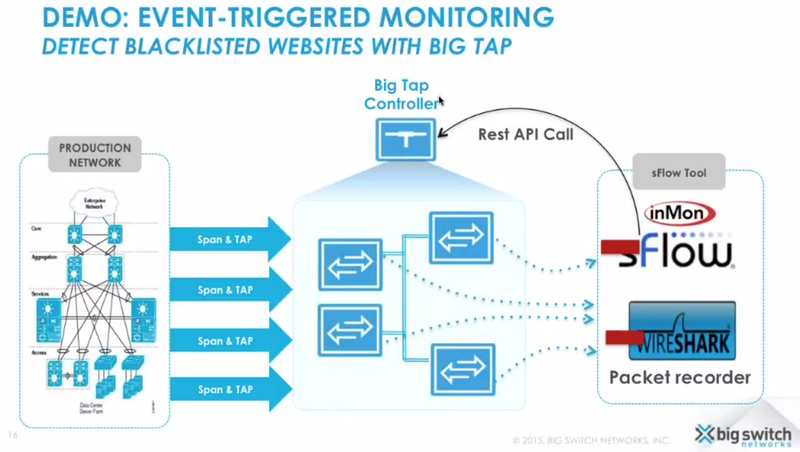 Once suspicious activity is detected, targeted captures can be automatically triggered using Big Tap's REST API. Blacklists are an important way in which the Internet community protects itself by identifying bad actors. Incorporating blacklists in traffic monitoring can be a useful way to find hosts on a network that have been compromised. If a host interacts with addresses known to be part of a botnet for example, then it raises the concern that the host has been compromised and is itself a member of the botnet. Black lists can be very large, larger lists can exceed a million addresses. Switches don't have the resources to match traffic against such large lists. However, sFlow shifts analysis from the switches to external software which can easily handle to task of matching traffic against large lists. The live demonstration uses InMon's sFlow-RT real-time analytics software to match sFlow data against a large blacklist. When a match is detected the Big Tap controller is programmed via a REST API call to capture all the packets from the suspected hosts and stream them to Wireshark for further investigation.